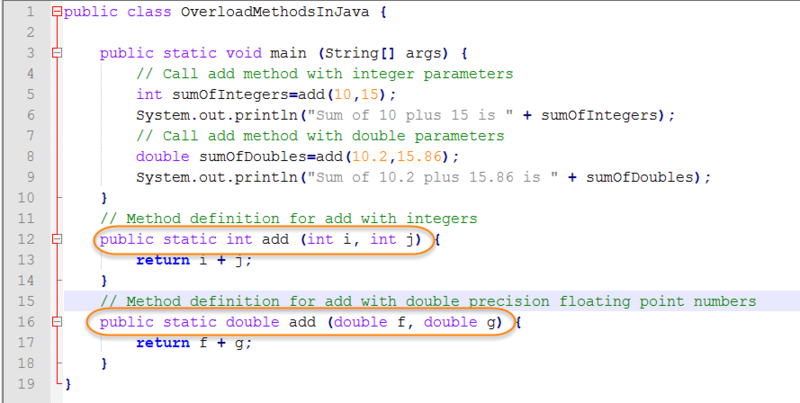 Overloading a method in Java means defining two or more occurrences of a method. Each method must be unique in its argument list or else the compile will fail. Overloaded methods are convenient when the same operation (e.g., add) must be applied to arguments of different types (e.g., integer and double precision floating point). To create overloaded methods in Java, follow these four steps. Two versions of the add method are provided, hence the add method is overloaded. Save your file as OverloadMethodsInJava.java. Open a command prompt and navigate to the directory containing your Java program. Then type in the command to compile the Java source. You are ready to test your Java program. Type in the command to run the Java runtime launcher and hit Enter. Notice the output from the overloaded add method.